When I was growing up in Ottawa in the 1980s, you could walk straight through the grand neo-gothic front doors of Parliament Hill. Without too much fuss, you could stroll over to the public galleries of the House of Commons and Senate. Or you could head to the parliamentary library and admire the elegant wood-ribbed structure that had been protected from the great 1916 fire by its cast bronze doors. When the Hill was bedecked by Christmas lights in the winter, my parents would load up the car and we’d join other families who drove the loop in front of the East, Centre, and West Blocks, admiring the decorations. Then, in 1997, a delusional man drove his jeep up the staircase in front of Centre Block, stopping just short of the main doors. After 9/11, private vehicle access to the hill was further restricted. In 2014, a lone gunman shot a sentry at the National War Memorial, then entered Centre Block and was killed in an exchange of gunfire with security personnel. Public access to the chambers of democracy has been maintained through it all, but with an increasing gamut of check-in points and security scanning measures, a cumbersome presence in those revered stone corridors. The main concourse of the Welcome Centre is topped by bronze screens and vaulted ceilings whose forms derive from the gothic geometries used throughout Parliament Hill. Now, the first phase of a fully accessible Visitor Welcome Centre greets visitors to Parliament Hill. It achieves the delicate feat of including updated, airport-like screening facilities, while preserving dignified, open public access to the seat of Canada’s parliamentary democracy. This is the first building to be constructed on Parliament Hill in almost a century, and the responsibility to the historic site weighed heavily on designers IBI Group and Moriyama & Teshima Architects. In response, to a remarkable degree, they’ve made the four-story building disappear. Three of the stories are sunk underground, with only the entrance making an appearance at grade. Even this entrance is integrated into the site. A stone retaining wall designed by Calvert Vaux subtly elevates Centre Block above the Great Lawn; that wall has now been extended to cap a new courtyard next to West Block. Arched entryways form porticos in the stonework, with recessed doors crafted in a weave-patterned bronze. A contemporary version of a shallow groin vault was used for the ceilings, giving a grand, spacious feeling to the security screening level. Inside, visitors enter a cross-vaulted entry area that overlooks the concourse, a level below. After passing through the scanning area, they descend to the concourse—a double-height space that includes interpretive projections, a boutique, and a gathering point for guided tours. 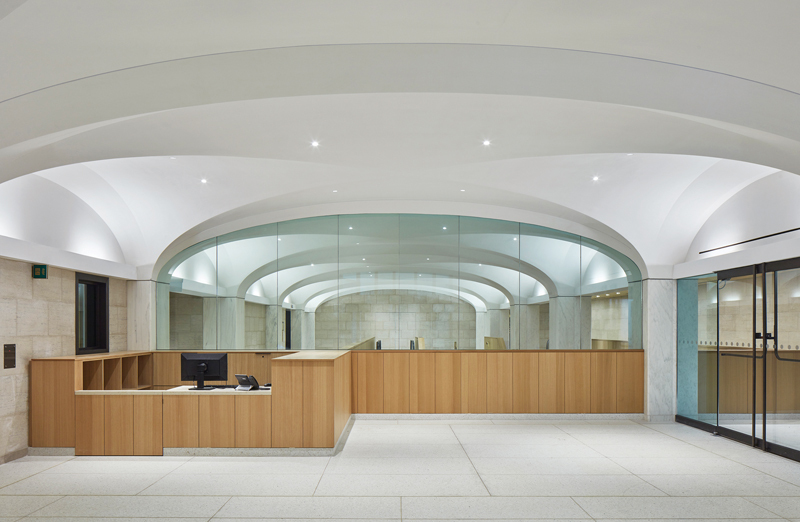 A barrel-vaulted passageway leads to the renovated West Block. Additional phases will eventually expand the facility to connect with East Block and with Centre Block, currently under renovation. The building’s main spaces are topped with a shallow cross-vaulted ceiling, rendered in acoustic plaster. A grand stair leads from the security screening level down to the concourse. 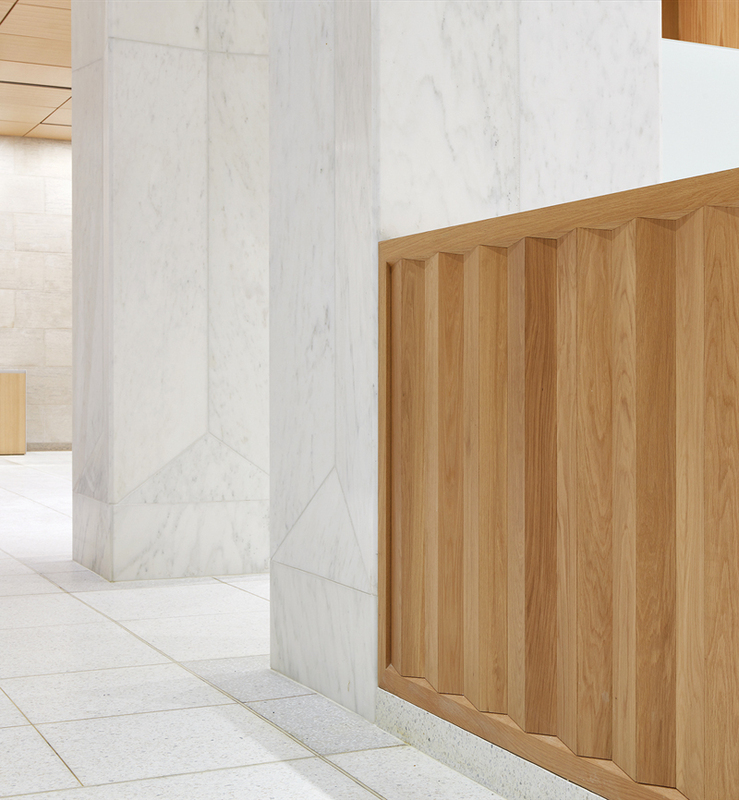 The interior’s minimalist palette includes white oak wall panels and Danby marble columns. 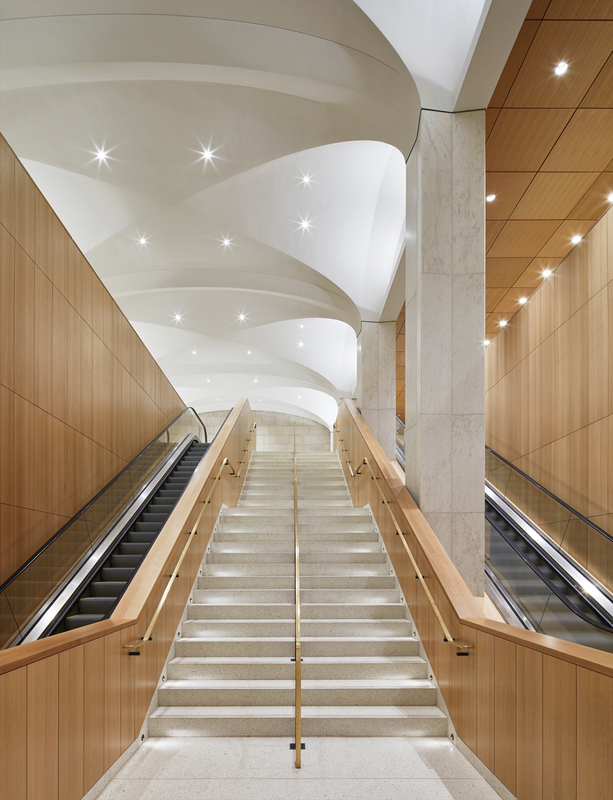 The ceiling design—a contemporary version of a shallow groin vault—gives a traditional inflection to the minimalist building. Early on the commission, recalls Moriyama & Teshima principal Carol Phillips, FRAIC, the architects decided to make a full inventory of the processional spaces and façades throughout Parliament Hill. What emerged was an appreciation of the Hill’s vaulted hallways and hierarchy of arched window openings—from pointier ones higher on walls to squatter ones lower down. They also developed a detailed understanding of how these arches were geometrically generated. To fine-tune the entry archways through the stone wall, the design team looked to Vaux’s bridges and tunnels in Central Park, whose forms also derived from Gothic principles. 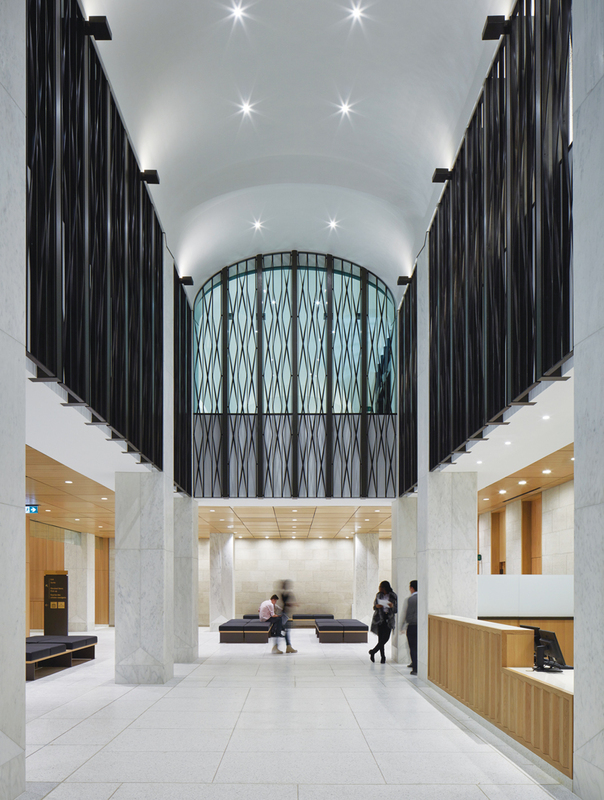 The logic of using different arch types to denote the relative importance of spaces informed the interior geometry of Welcome Centre elements ranging from the broad ceiling arches to details such as the patterning of the grand stair’s bronze screen. The latter is a filigree of cascading pointed arches, in equal part neo-gothic and art deco. To soften the appearance of the robust structure, a pleated language was used for elements including the columns and millwork. 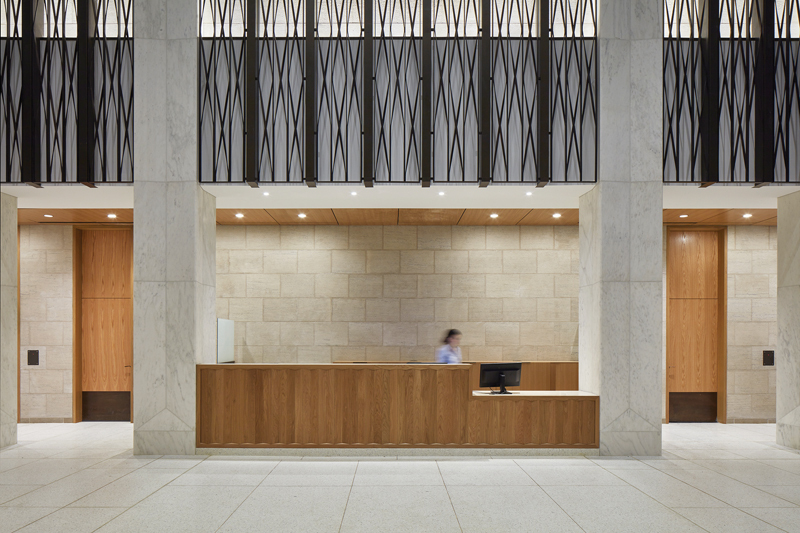 A simplified material palette—terrazzo floors, honed Danby marble columns, near-white Adair limestone walls, white oak partitions, bronze fittings—makes the building feel exceptionally calm and composed. This restraint is also shown in a series of sensitive details. For instance, to diminish the visual weight of the large square columns—a heftiness needed to keep the facility secure and carry the landscape above—slight V-grooves are carved into the column profiles on all four sides. At the top of the columns, these pleats accentuate the spring point of the vaults. Similar folded details appear on the deeply chiselled stone frames at the front arches, a fold in the bronze stair handrails, and pleated millwork on the front doors and at the reception desks. A two-storey space in the lower concourse faces the welcome desk, and forms a meeting point for tour groups. “Our building is so robust,” says Phillips. “Introducing grace to its spaces was always part of the mandate.” The commitment to making a building that feels elegant and spacious—despite being largely underground—is also evident in the planning. In most airports, screening processes entail maze-like routes. Here, however, the visitor spaces are purposefully expansive and intuitive to navigate, with overlooks and glass walls allowing glimpses into the rooms ahead. Back-of-house spaces are almost invisibly integrated, including access to the secure lower two levels, which are used for mechanical systems and materials handling. 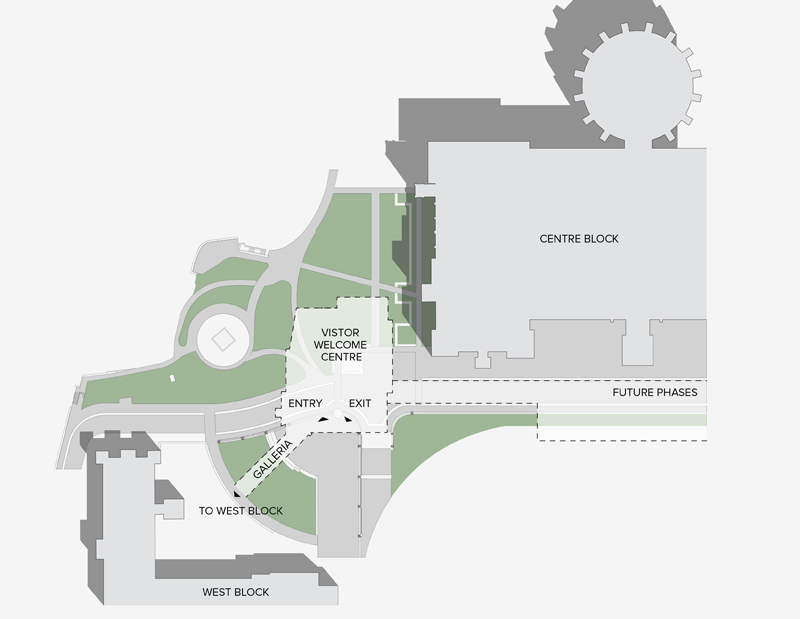 Site plan showing the location of the underground Visitor Centre, between Centre Block and West Block. An exterior aspect that Phillips is especially proud of is the steel guardrail that tops the extended Vaux wall. At first, this seemed a minor detail—but then, the team realized that it would set a precedent for retrofitting the original Vaux wall along the entire forecourt of Centre Block, which currently lacks a guard rail. “It started to take on much more weight,” says Phillips. “It became this little piece of sculpture that had to work seamlessly with the gothic language—it had to look like it could have always been here, but it had to be contemporary, of its time, and had to have movement.” Turning to the gothic geometries they had studied, they created a series of double-helices that interweave in three dimensions to form pointed arches.